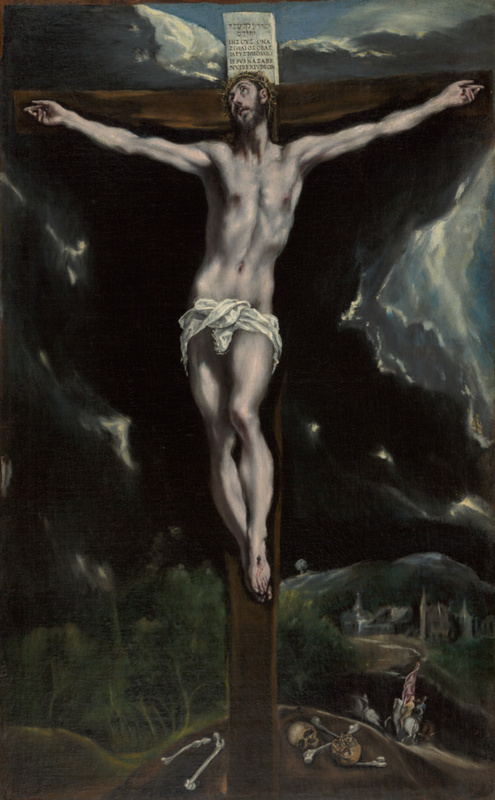 In this painting, El Greco combines the iconic power of the crucifix with the expressive power of landscape painting. He sets the cross atop Golgotha, the "place of the skull," with Jerusalem looming in the background. He eliminates the other characters from the biblical narrative, encouraging the viewer to contemplate Christ and his suffering. El Greco's dramatic colors and exaggerated proportions distort the figure, illustrating the transcendent moments before death, when Christ sublimated his physical pain and commended his spirit to God. Light plays across his undulating form, illuminating his tortured body against the dark background. Storm clouds mass around his body, whose glowing pallor is echoed in the dramatic flashes of light playing through the sky. His eyes turned heavenward, Christ looks away from the bones and skulls that lie at his feet, to emphasize his triumph over death. El Greco and his studio produced several variations of this subject. The significance of the horses and riders carrying a standard in the distance is unknown, though it is repeated in most versions of this composition. The painting was unknown prior to being purchased by a Spanish family at a flea market around 1950. It remained in their possession until the year 2000, when it was acquired by the Getty Museum. Sotheby's, London. Old Master Paintings, Part I. July 6, 2000, pp. 82-85, lot 36, ill.
Jeromack, Paul. "Old Masters, London." Art & Auction 22, no. 10 (Summer 2000), p. 53, ill.
"Old Master Paintings." Sotheby's Art at Auction 1999-2000 (London: Sotheby's, 2000), p. 49, ill. The J. Paul Getty Museum Handbook of the Collections. 6th ed. (Los Angeles: J. Paul Getty Museum, 2001), p. 144, ill.
Ferino-Pagden, Sylvia, and Fernando Checa Cremades, eds. El Greco: Eine Ausstellung des Kunsthistorischen Museums Wien, exh. cat. (Vienna: Skira, 2001), pp. 176-77, no. 25, ill., entry by Dawson Carr. Ravenal, John B., ed. Robert Lazzarini, exh. cat. (Richmond: Virginia Museum of Fine Arts, 2003), pp. 44-45, ill.
Allen, Denise, et al. Masterpieces of Painting in the J. Paul Getty Museum. Rev. ed. (Los Angeles: J. Paul Getty Museum, with Thames & Hudson, 2003), p. 111, no. 60, ill., entry by Dawson Carr. Evans, Helen C., ed. Byzantium: Faith and Power (1261-1557), exh. cat. (New York: Metropolitan Museum of Art, with Yale University Press, 2004), p. 508, no. 310, ill., entry by Dawson W. Carr. The J. Paul Getty Museum Handbook of the Collections. 7th ed. (Los Angeles: J. Paul Getty Museum, 2007), p. 102, ill.
Schroth, Sarah, and Ronni Baer, eds. El Greco to Velázquez: Art During the Reign of Philip II, exh. cat. (Boston: Museum of Fine Arts, 2008), pp. 185-86, 191, no. 2, ill.
Marías, Fernando, et al., eds. El Greco's Visual Poetics, exh. cat. (Osaka: The National Museum of Art, 2012), p. 128, under no. 37, entry by Yusuke Kawase; pp. 142-43, no. 43, ill., entry by Yusuke Kawase; p. 292.